Home / Comic Reviews / Graphic Novels / Are You My Mother? Alison Bechdel, artist of the New York Times bestselling graphic memoir Fun Home, has created another masterpiece. 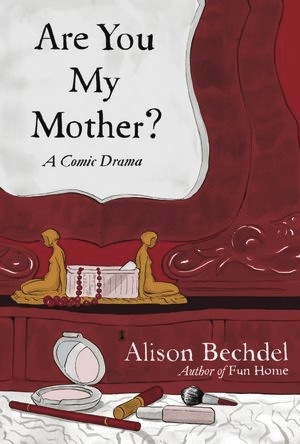 In turns hilarious and heartbreaking, Bechdel’s new memoir Are You My Mother? tackles her relationship with her mother, intelligently exploring how that relationship has shaped Bechdel’s lifelong quest for intimacy. The narrative is sensitive but brutally honest, inviting us into Bechdel’s emotional struggle as she journeys from one home to another, one romantic relationship to another, one therapist to another. Past and present, dream and reality are seamlessly woven together as we visit the annals of childhood memory and the pages of psychoanalytic theory. Are You My Mother? continues the story of Fun Home, which documents Bechdel’s struggle with obsessive compulsive disorder and her father’s struggle as a closeted gay man who ultimately commits suicide. Although the two memoirs overlap, Are You My Mother? also works well as a stand-alone story. In it, Bechdel portrays herself writing Fun Home, clashing with her mother repeatedly as she tries to unpack her family’s history and her own struggle for mental health. Although Bechdel and her mother are rarely together, her mother’s regular phone calls keep Bechdel tethered to her past for better or worse. Bechdel’s mother is an enigma; though she clearly cares for her daughter, their physical affection ended abruptly when Bechdel was seven years old. Once a dedicated actress, Bechdel’s mother is now a widow who resents her daughter’s choice to put their family’s private business on display in Fun Home. Bechdel transcribes her conversations with her mother and pieces them together in this memoir, seeking to capture her mother’s unique voice and understand the woman behind it. In Bechdel’s quest to understand her mother and herself, she turns to the insights of psychoanalysis. Spurred on by her therapists, Bechdel immerses herself in the writings of Sigmund Freud and Donald Winnicott, excerpting their work and presenting it alongside her own story. Although Bechdel sometimes makes the connections between theory and experience explicit, she often allows the two threads to unfold simultaneously, giving psychoanalytic captions to present-day pictures and speech. In one such moment, while portraying a teenaged fight with her mother over a word’s pronunciation, Bechdel uses her captions to expound upon Winnicott’s theories about familial hate. By saying through Winnicott that “hate is a part of love,” Bechdel puts a hopeful spin on a personal story which would otherwise have appeared completely loveless. Yet she never makes this connection explicit, instead letting her readers decide for themselves whether they will see love in a moment of family conflict. Bechdel ushers readers into her own psychoanalytic process, a space which is both daunting and richly rewarding. In an era when psychoanalysis is often dismissed as passé, Are You My Mother? stands as a unassuming apologia for its continued relevance. Insights from Freud and Winnicott provide the breakthroughs that help Bechdel see her mother with new eyes: she comes to understand not only how her mother has failed her and contributed to lifelong struggles with anxiety and rejection, but also how she can move beyond those struggles and come to appreciate the good her mother has done. Bechdel summarizes her readings of psychoanalysis beautifully, handling Freud and Winnicott with prestidigitation that makes even their dense theoretical writings accessible to a broad audience. Although Bechdel’s handling of these authors is perhaps oversimplified—she is often forced to gloss over theoretical complexities because of artistic constraints, and she fails to mention post-Freudian developments in psychological theory—this in no way undoes the significance of her achievement. Best of all, she makes her readers less ashamed to admit our own neuroses. With witty poignancy, she demonstrates that even the mentally healthy can struggle for mental health, that it is possible to recognize the faults of your family and yet come to love them more, not less. In the spirit of the psychoanalysis, which reminds us that events of long ago still have power in the present, Bechdel’s storytelling is shamelessly non-chronological. Beginning with a dream, ending in a memory, and spanning nearly a century of history in between, the book is arranged thematically rather than temporally. Far from impeding our understanding, this approach heightens the impact of individual scenes by placing them in contexts that make them meaningful. Nowhere is this strategy more apparent than in the book’s closing vignette, a memory in which Bechdel’s mother plays a game of make-believe with her daughter, pretending to give her leg braces and special shoes so that she can walk even though she is “crippled.” Coming immediately after a hopefully present-day epiphany which points toward eventual healing, this remembered game of make-believe becomes a metaphor for the ways Bechdel’s mother has equipped her to find a way out of darkness. Despite the heaviness of her topic, Bechdel’s tone and graphic style are inviting and accessible. Clean lines and a variety of paneling strategies keep the eye engaged, while the simplicity and wit of her storytelling drive the narrative forward. Moments that in film might seem dull and motionless—in a therapist’s office, on the phone, reading a book—become riveting in Bechdel’s hands. Her artistic mastery makes what could have been an unremarkable story truly extraordinary. In one memorable scene, Bechdel’s mother argues that “the self has no place in good writing.” Bechdel responds in defense of her art: “Don’t you think…that if you write minutely and rigorously enough about your own life… you can, you know, transcend your particular self?” Although the argument doesn’t persuade Bechdel’s mother, it is the key to this memoir’s success: a minute and rigorous record of one particular life that tells a universally human story through its artistry and honesty. By illuminating her own journey, Bechdel’s pathography illuminates the terrain of personal and familial dysfunction for her readers as well. Are You My Mother? is a triumph of graphic medicine, worthy to be read again and again.